Put A Little Umbrella In Your Drink: Quidam is Coming to Detroit (February 2-5) :: PLUS Behind the Scenes with Cirque du Soleil! 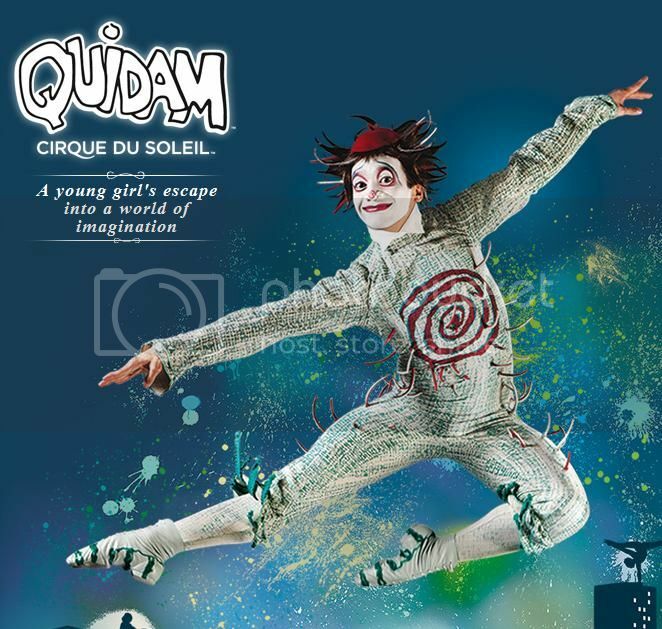 Quidam is Coming to Detroit (February 2-5) :: PLUS Behind the Scenes with Cirque du Soleil! If you are a frequent reader of my blog then you know I am a *huge* Cirque du Soleil fan! From the incredible acrobatics to the powerful live music to the heartfelt story - every single Cirque du Soleil show is a must see event. I have seen close to ten different shows all over the US. Quidam is one of the shows that are currently on tour. It is coming to Detroit this weekend! Quidam is pronounced "Key-dahm" and is a mesmerizing show full of surprises and amazing acrobatic feats. It is a show that the whole family will enjoy. I had the pleasure of going backstage today to see what happens behind the scenes! As you might expect there were performers stretching and practicing their routines. Their flexibility and strength fascinates me! Then we were lead to the stage where one performer practices at a time. Cory Sylvester, who has been with Cirque du Soleil for six years, was perfecting his German Wheel routine. The balance and strength required for the German Wheel is very evident. We also had the opportunity to check out the wardrobe area. One of the things I love most about Cirque du Soleil are the stunning costumes. What a treat to be able to see what goes into making the performers look so incredible. From hair to makeup, the performers completely transform themselves into character. Fun Fact :: The performers are all taught to apply their own makeup! Don't miss your chance to see Quidam! It is an experience that you will never forget. Quidam will be in Detroit this weekend! Check the schedule to see if it is touring to a city near you. In 2012, Cirque du Soleil will present 21 unique shows simultaneously around the world! It is hard to believe that it all started from a group of 20 street performers in 1984. Since then, they have delighted more than 100 million spectators in over 300 cities on six continents! Quidam will perform seven shows only February 2 - 5 at Joe Louis Arena. Tickets are available at the Joe Louis Arena box office, by calling 1-800-745-3000 or online at www.cirquedusoleil.com/quidam. The international cast of Quidam features 52 world-class acrobats, musicians, singers and characters from 18 different countries. Performances include Cloud Swing, Diabolo, Handbalancing, Skipping Ropes and of course the German Wheel. Want to preview the show? Check out this great video! Can't see Quidam? Then visit Cirque du Soleil to find another show near you! Disclosure: I did not receive any financial compensation for this post. The information provided in this post came from the sponsor. All of the opinions are my own. See my full disclosure.